Hey everyone. I really enjoyed last night's episode of LOST, which I won't discuss here because some people apparently haven't yet seen it. I can say it deals with Sun and it added a big dose of intrigue at the end. Auburn football is off until a week from Tuesday. That means we'll have to spend the next 10 days rehashing the stuff we've seen so far. My plan is to break down the new coordinators in bullet form to give you all a better understanding of these guys, how they operate and how they roll on the field. I may wait until next week to unfurl that flag as the kids say. The Fighting Lebos lost for the 11th time in 13 games on Thursday afternoon. Vanderbilt toyed with them. I found it odd afterward how Jeff Lebo valiantly stuck with the "we're so small" argument. Whose fault is that? There also was some talk after the game about Auburn's candidacy in the inaugual College Basketball Invitational, which is a start-up postseason bracking aiming to cut into the NIT's action. Word has it that $60,000 buys eligible teams a home game in the tournament. Would Auburn do that? Absolutely. Will Auburn get that chance? How can it? You're looking at 65 teams in the NCAAs. The NIT, according to this bracket from the NIT's website, includes 32 teams. I'm really surprised by that. The last I'd heard, the field was being trimmed to 20 or 16 or something like that. Not so. The CBI will include 16 teams. So that means 113 teams will participate in the postseason shenanigans. Is Auburn in that discussion? That's 73 + the two break-even teams. So 75. Is Auburn one of the next-best 38 teams? That's certainly feasible. As ridiculous as it sounds, you know, Auburn could have a shot at this thing. If it's truly about money, as the Missouri athletic director said recently, the Tigers are a possibility. Hey everyone. Here we are. I'm sitting at home, ready for a big day of Auburn athletics. It's 6:11 a.m. on the dial. Scrimmage starts at 7:30. I'll be back with a brief scrimmage update around 10. Then I'm off to Atlanta for the SEC basketball tournament. I'll try to add more details from both football and hoops as the day progresses. Vanderbilt 93, Auburn 82: The 7-foot center, AJ Ogilvy, went 12-of-13 from the field and scored 27 points. 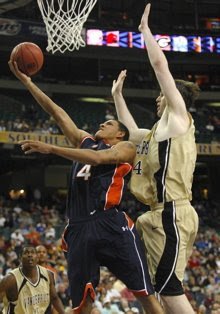 SEC Player of the Year Shan Foster supplemented that with 26 points. The Tigers couldn't get any stops. They had no answer for Ogilvy. That's a wrap. Auburn finishes 14-16 overall and 4-12 in league play. You may not believe this, I sure didn't, but an official from the new postseason basketball tournament (the College Basketball Invitational) called Auburn to request a statstical overview of the team. Seriously. This is a start-up tournament attempting to rival the NIT. In a Kansas City Star story that ran a few days ago, the Missouri athletic director said teams basically pay $60,000 to get in the tournament ... within reason. Is Auburn within reason? I can't believe it. Scrimmage has ended. It was 100 plays. Offense was very good on the opening drive ... six plays, 80 yards, 5-for-5 passing from Kodi Burns. Defense controlled the next 70 plays or so. The offense regained the edge during the final 20 plays. QB Chris Todd -- It's clear he has the skills to be a good player. He eludes pressure with ease, can look one way and quickly throw the other way, he knows where to put the ball in relation to where the receiver is running. If he gets his arm strength back, Todd will be the starter. I saw that today. CB Jerraud Powers -- Made a really nice interception off Kodi Burns deep. Powers timed the jump perfectly, made the catch and stayed in bounds. He also broke up a screen pass earlier in the day that, really, nobody else on the team would have broken up given the same scenario. DT Sen'Derrick Marks -- He was overpowering up front today. He was at least indirectly responsible for several sacks. TE Tommy Trott -- He has a grace, I guess you'd say, that tight ends don't have. He's lost 20 pounds, though he's seems like more of a bruiser out there. It's obvious that he's thrilled with the new offense. The offense will be thrilled with him. **I didn't realize Neil Caudle was so efficient. He didn't look great at all. **LB Josh Bynes was getting a lot of praise. **DT Jake Ricks is out for the rest of spring with a broken right hand. **TB/WR Mario Fannin will have surgery on Tuesday to repair his left shoulder. **WR Robert Dunn missed the scrimmage because of class. **TB Brad Lester missed the scrimmage because, as Tuberville said, coaches didn't want him being the only tailback out there. Doesn't make sense to me, either. **TB Ben Tate spent the morning running the stairs at Jordan-Hare Stadium, ostensibly still rehabbing that troublesome hamstring. 18-80 INT by Powers. Thrown into double coverage. Burns left it short. >12-16 C Knox tells Swinton to "run over" Mike Slade and Neal Vickers. Nope. An anonymous poster commented on yesterday's blog that I'm a "wuss" for hiding behind a keyboard. This is an apparent reference to today's WMSP morning show, which must have generated that flawed conclusion. I was on the show Tuesday morning, nary 48 hours ago, and haven't heard from either host since then. I will be on The Roundtable, WMSP's early-afternoon show, today and possibly Friday. Hey everyone. I have decided to do something I consider somewhat novel on Thursday. Inspired by Phil Collins' two-continent concert for Live Aid in 1985, I'm going to cover Auburn's 7 a.m. practice, drive to Atlanta, cover Auburn's game against Vanderbilt in the SECs (2:15 CDT) and then take it back to the house. 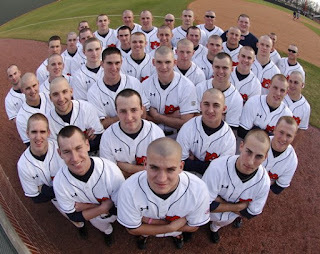 Auburn baseball's promotional czar, Dan Froehlich (Fray-lick), noted recently that the program is providing copies of the shaved-head photo in exchange for $10 donations to the American Cancer Society. It's the image at the top of today's blog. Copies may be purchased through the university's web site. There was talk today on WMSP about my blog comments from yesterday, which weren't particularly positive about the station's morning hosts. I'm planning to appear on the station's afternoon show on Thursday to discuss the matter. The HOTTIES know I'm not a fan of Barry McKnight or the other guy because they serially dis me and the Advertiser for mostly silly reasons. Labeling me a "moron," or eliciting similar rhetoric from friendly callers, has been going on since the late 1990s. Is this considered evolution? Also, a caller to the afternoon show ("The Roundtable" with Amos and Bag) wondered why I would go on the air Tuesday morning and then "attack" the morning hosts on the blog. Being on someone's show doesn't indicate friendship or even respect. The only time I ever appeared on the show without being asked came like five years ago, when Barry questioned the legitimacy and legacy of rap group Public Enemy. Chuck D and Terminator X deserved backup. I was happy to oblige by calling in. There was a mildly interesting indirect exchange between Jeff Lebo and Vanderbilt coach Kevin Stallings at the SEC Tournament press conferences today. Lebo said he was glad to not be playing Vanderbilt in Nashville because ``they haven't played as well away from home." Vandy is 19-0 at home and 6-6 away. Seems reasonable. Stallings was asked about that and didn't seem to like Lebo's statement. ``That seems to be the thing that people want to throw on us," Stallings said. ``I'm guessing if we were 17-2 at home instead of 19-0 that people wouldn't be talking about a road record. We'll see." OK. So a HOTTIE, who asked to remain nameless, emailed this nugget: "I didn't know about Live aid until I googled it just now." He is ebaying the DVDs in hopes of ingesting all the 80s goodness those concerts provided. See, young people, Phil Collins was cutting edge back then because he played the London show early, took the Concorde to Philadelphia and played a second Live Aid gig that night. Being a bi-continent musician was big news back then. So that got me reminicing about the concert. I was at summer camp. My madre taped it for me. I was SO geeked to see the Duran Duran set because I couldn't have been a bigger fan. Mid-way through the performance, Simon Le Bon absolutely mauled a note that remains stuck in my head. Check it out. It's at the 2:54 mark of this here video. Check out guitarist Andy Taylor's skyward gaze after that horrid display. Oh damn. Hey everyone. I hope you Montgomery-based peeps enjoyed my brief bit on WMSP-AM with Barry McKnight this morning. I don't like participating in that radio program because McKnight and the other guy think it's trendy to rip the Advertiser on the air. It's as if that radio program somehow is a bastion of journalistic credibility. Now that I think about it, though, it is pretty credible because the announcers generally recite our stories on the air. OK, on to football. The Fighting Tigers held an almost two-hour practice this morning amid foggy-ish, overcast conditions. There were some interesting things occurring, which is a big jump up from Monday. DE Antonio Coleman was dressed in pads at practice, participating in what I'd describe as "light running" exercises. He's still dealing with some lingering neck stiffness. All the neurological signs are good. Coleman confirmed that he had spoken with LT Lee Ziemba, whom, depending on your perspective, was directly or indirectly involved in the hit that caused Coleman's temporary paralysis. "It definitely won't happen again," Coleman said. ``That's all I'm going to say about that." QB Chris Todd, he of the injured throwing shoulder, participated in throwing drills for the first time in almost two weeks. I can't say he was great or terrible. He wasn't really challenged or anything. OC Tony Franklin didn't seem all that impressed with Todd's work, saying the youngster was at 30 or 40 percent. Bad news for QB Neil Caudle: Franklin, days after admonishing No. 19 for his interception troubles, threw another shrimp on the barbie Tuesday. Franklin said Caudle is paying too much attention to the rush. That's a bad thing. Franklin was asked why it's such a bad thing. ``If I drop back, then all of the sudden I feel it, and start looking at it, you've got no chance to ever play," Franklin said. ``You've got to feel the rush, and as I feel it, my eyes stay (ahead) as I slide to avoid it. But if you look at it, and try to find a way to avoid it, you can't play. It is not going to happen." DT Tez Doolittle thinks he will get a sixth year of eligibility. That much is clear. 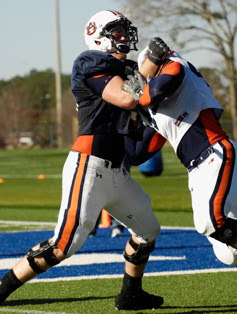 And Auburn has assured Doolittle that he'll have a scholarship if the NCAA allows him to play in 2008. He tore an Achilles tendon during two-a-days last year. Doolittle said he's encouraged by the information he's received so far. ``I'm just waiting. I don't know what all they're saying, but it's looking good," Doolittle said during Pro Day on Monday afternoon. ``When Coach Lutz said I had my scholarship back, I was happy about that. I could have gotten the year back and not gotten the scholarship, then I'd have to pay out of my pocket or go to a school that would have given me a scholarship." NOTE: Andy Lutz is a high-roller administrative guru. DT Jake Ricks suffered an injury to his right hand during three-on-three blocking drills mid-way through practice. That's why you don't seem him listed in the one-one-one breakdowns below. Assistant coach Don Dunn said Ricks was headed to the hospital for x-rays. Here are results from today's one-on-one line drills. Offense was the winner. NOTE: That next-to-last hit by Goggans on Pugh was the hit of the day for me. Pugh is a good player, no doubt, but Goggans brought a different level of rage to the table there. Pugh quickly regrouped as you'd expect. I'm just saying: Goggans is so much better than he was this time last year. One of the HOTTIES, Jimmy from the West Coast, passed along this interesting commercial featuring former tight end Frank Thomas, whom I believe had a slightly better career in baseball. Hey everyone. Today was a slow day on the Plains. That must mean it's PRO DAY, which is among the dullest events I cover every year. That's not to say it's meaningless. It's just ... players running drills that don't involve anyone else. And some of you all rip me for being a soccer fan! Soccer is Mardi Gras compared to this. Anyway: They had a full house today. Scouts from every NFL team and two head coaches (Pittsburgh's Mike Tomlin and Cincinnati's Marvin Lewis) were on hand to view some prospects. It's clear that Pat Sims and Quentin Groves were the big draws, though Carl Stewart's numbers are alarming. This kid couldn't play a bigger role? Here are your results from today's action. Sorry this stuff is jumbled. I don't have a more efficient delivery method. Name --> Height/Weight/Vertical/Long Jump/Bench/40/short shuttle/"3 cone"
**Numbers in parenthesis are numbers from the NFL Combine, which I figured you all would want to see. If they're in parenthesis, that means the kid didn't participate in that drill today. ***"Bench" = number of reps at 225 pounds. 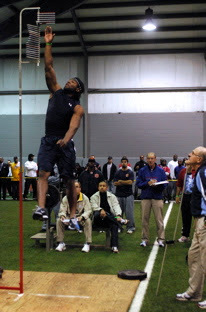 He ran a 4.40 at the Combine. Hey everyone. My trip to Atlanta went really well. The highlight of the trip was touring the Lenox Apple Store, having my wife tell me that I could get a MacBook Air and actually saying: Nah, I don't need it. I'd rather spend my money on fun stuff like beach vacations and trips to Ohio rollercoaster parks. Be sure to check out my Sunday story on Antoine Carter, aka Hot, who is running with the No. 1 defense these days. I think he's going to be an outstanding player. He has added 20 pounds since the Chick-fil-A Bowl and looks like a more menacing element in uniform. The added weight hasn't affected his quickness; I've seen him school OT Lee Ziemba in pass-rush drills several times this spring. This would be a good time to mention the rise of fellow DE Mike Goggans as well. He clearly has gained (good) weight and seems significantly more physical now than he was during two-a-days. With him and Hot and Antonio Coleman, Auburn has a really nice trio going. I guess A.J. Greene will be the fourth guy, though he's pretty inconsistent right now. The baseball team swept Virginia Military Institute this weekend, bumping the Tigers' record to 10-4. That's 4 wins against ETSU, 4 wins against VWI and 2 wins against Davidson; 4 losses to Florida State. I still can't get a read on how good this team is. **Hitter of the series: 3B Joseph Sanders goes 6-for-17 with 7 RBIs. Also played 2B on Sat. and Sunday. **Pitcher of the series: Cory Luckie earned a complete-game win on Saturday by allowing one unearned run and no walks. He struck out seven batters. He's a freshman, too. -->3B David Cunningham goes 4-for-8 during the final two games of the series. He's hitting .438 in six games this season. -->OF Ben Jones, working mostly in a pinch-hitting capacity, goes 3-for-6 with 2 RBIs. -->The bullpen worked 11 innings and surrendered two earned runs. It walked just one batter and fanned 17. That's efficiency.